Imagine for a moment what it’s like growing up a child of a migrant farmer in America. On top of all the normal trials and tribulations of adolescence, you’re fighting a constant uphill battle trying to fit into a language system and culture that isn’t your own. And just when you feel like you’re starting to get your bearings, your family has to uproot itself and move on to another city in another state in search of more work. For these children, understanding who they are and realizing who they want to become is only made more difficult by an educational system that too often marginalizes them. That’s why the experiences offered in the Saugatuck Center for the Arts' (SCA) summer migrant program, Growing Young Artists, are so important. For the past four years, SCA has welcomed over 6000 children of migrant farmers inside its facilities for a series of arts and culturally focused educational experiences that activate their individual creativity and help them build key skills including literacy, language, problem solving, team building, communication skills, and social etiquette. Kendall College of Art and Design of Ferris State University (KCAD) alum Salvador Jiménez (’14, MFA Drawing) understands the situation these children are in better than most. Jiménez has been uprooted himself, having moved with his family to from Mexico to Chicago at the age of 15 before eventually coming to Grand Rapids to pursue his MFA at KCAD. 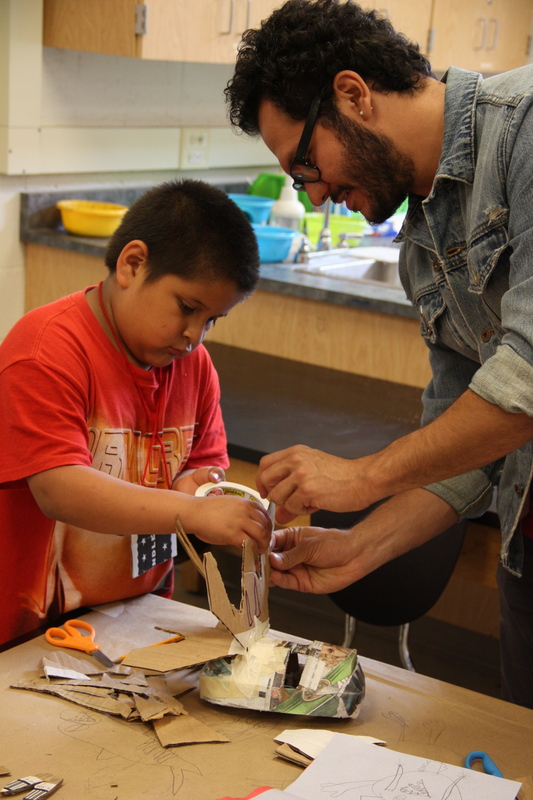 This summer, he had the opportunity to connect with students in the Growing Young Artists program through an artist residency at SCA. Creative expression became the vehicle through which Jiménez forged his identity in America. Now, he says he feels privileged to be able help set others off on a similar path. “The most important thing is to give them the attention that they deserve. Some people don’t even know that these children exist. What this program does is create an environment where they feel comfortable, where they feel like they have something they can bring to the table that can benefit everyone. It’s this idea of trying to get them to a point where they’re free and they can express their own ideas." Jiménez first interaction with the students was a presentation in which he shared his own journey. “I think it’s important for the kids to see that if I could do it, they can do it too,” he says. Then, while a team of other artists led classes over the course of the program’s six sessions, Jiménez guided the children on an extended art project where they each created their own picket signs projecting ideas they felt strongly about, and papier-mâché and plaster masks that reflected their personalities, hopes, struggles, and dreams. At the program’s closing ceremony, the children put on a mini-performance for their parents and SCA staff using their masks and signs. Jiménez says the idea for the performance was inspired by El Teatro Campesino, a farm worker’s theatre group started by playwright and Chicano theatre pioneer Luis Valdez during the Chicano farm labor movement led by Cesar Chavez in the 1960s.